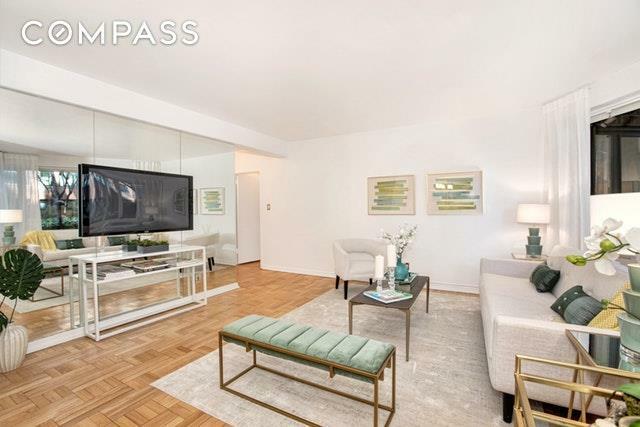 Make lush garden views your daily backdrop in this gorgeous garden-level, one-bedroom, one-bathroom co-op home in highly sought-after Sutton Place.Lined with oversized windows framing the building's private gardens, entire apartment fronting a secured roof garden. This spacious abode is filled with sunlight and has a rare and desirable indoor-outdoor ambiance. The outdoor wonderland, brimming with magnolias and hydrangeas paired with some architectural ingenuity produces a strikingly quiet and beautiful sanctuary that imparts a feeling of seclusion and tranquility. As a purely decorative space, the garden allows no foot traffic to interrupt your peaceful views or privacy. 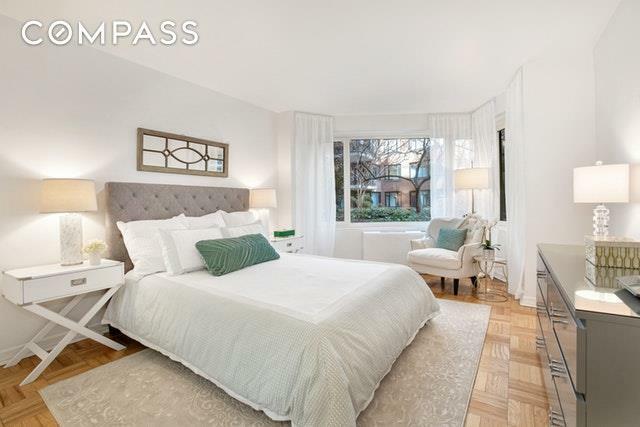 Tall ceilings and hardwood floors frame the bright and airy living and dining room which is large enough to configure a second bedroom out of and the adjacent kitchen offers tons of cabinet space and a convenient service entrance. The generously sized bedroom easily accommodates a king-size bed, and the windowed nook is an ideal spot for reading or lounging. Draped in Italian marble, the en suite bathroom is an upscale oasis, and four large closets placed conveniently throughout the home ensure storage will never be a concern.60 Sutton Place South is a full service postwar cooperative boasting a circular driveway and porte-cochere entry. Residents of the pet-friendly building enjoy full-time doorman and concierge service, live-in superintendent, onsite parking garage, gym, storage, and bike room.Located in one of New York City's most desirable enclaves, this fine neighborhood enjoys both residential tranquility and spectacular convenience. Dining, shopping, and services line the nearby streets of Midtown East, and the U.N. is just five blocks south. 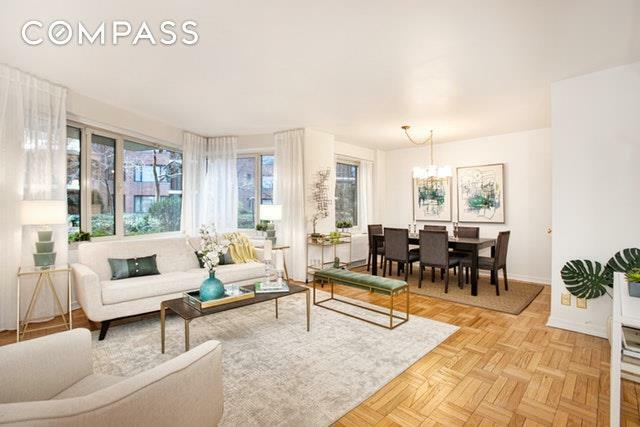 Situated directly across from the Sutton Place Park green, this lovely home is inches away from breathtaking East River views and outdoor space. Enjoy miles of uninterrupted waterfront paths for walking, running or biking along East River Promenade, or head under the 59th Street Bridge to find two well-maintained dog runs. 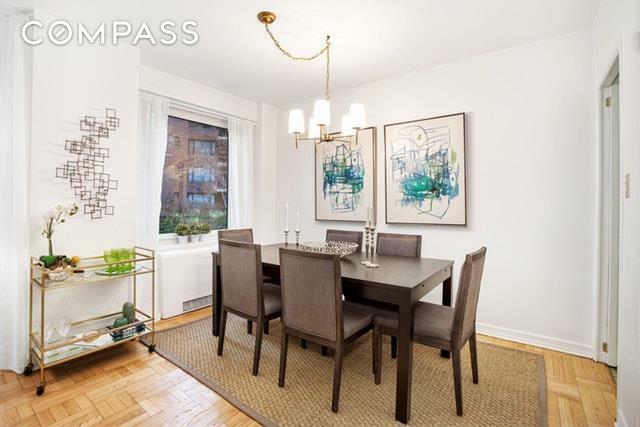 Transportation is effortless from this accessible neighborhood with E, M and 6 trains and multiple bus lines nearby.